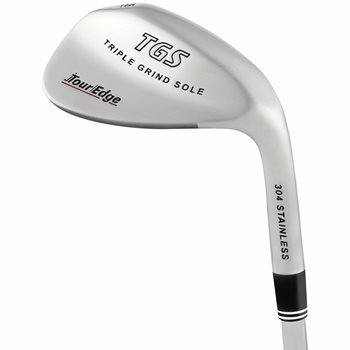 The Tour Edge TGS Triple Grind Sole Stainless wedge has a pear-shaped head design and Tour-inspired triple grind sole that eliminates bounce from the heel and toe areas. The TGS sole dramatically improves shotmaking versatility from a variety of playing conditions by allowing players to open and close the club face without fear of the head grabbing the turf. The wedge features USGA conforming grooves CNC milled to the maximum allowable size for precise control. The classic stainless steel head finish provides a classic look for enhanced visualization.